Clink image on left to read SM Times article on the 2016 Cool Summer Cup. The Coastal Valley Soccer Club (CVSC) played in the SLO Summer Classic this past weekend. The CVSC Katana boys under-17 team won its division. In pool play, Katana defeated Vacaville United 3-0 with goals from Eric Hidalgo, Alexis “Shorty” Garcia and Jorge Martinez. In the semifinal Katana topped the San Luis Obispo Soccer Club with another 3-0 score with goals from Josue Chavez, Juan “JD” Montolongo and a penalty kick by Alex Uribe after Eduardo “Lalo” Rodriguez was taken down in the box. Katana also faced Los Gatos United in pool play with that match ending in a 1-1 draw. Katana was down 1-0 for most of the game until Jose “Whacker” Juraez scored a rebound goal from a Montolongo corner kick. Katana had a re-match with Los Gatos United in the championship game. Los Gatos went up 1-0 in the first half. Then six minutes into the second half, Josh Dyson made an attacking run into the Los Gatos box and was fouled, resulting in a PK by Bryan Rivera who scored to tie the game. At the end of regulation, the score was still 1-all, forcing a 10 minute overtime period. Seven minutes into overtime, Juraez scored the game-winner. In other tournament action CVSC Outkast G00 won the girls under-17 championship for their fourth tournament championship of the year. In the boys under-15 division CVSC Pumas B02 also won a championship. CVSC Strikers G03 and CVSC Impact G05 also brought home Finalists medals from the tournament. The tournament has historically been know as North vs. South. This is because the tournament has historically featured the best teams from southern California versus the best teams from northern California. We are proud to announce that CVSC will have teams playing in the Southern California National Premier League (SCNPL) this spring. These teams will face top level competition from Southern California and Nevada. Coastal Valley Soccer Club (CVSC) held its 5th annual awards dinner Saturday night December 5, 2015 at the Rancho Bowl Banquet room in Santa Maria. Four awards were handed out to recognize the top male and female Players for the 2015 year, as well as the Coach and Volunteer of the year. Key attributes for the players which were nominated were on the field performance coupled with sportsmanship and academic excellence. The CVSC 2015 Female Player of the year is Ayziah Simmons of CVSC Outkast G00 based in Lompoc. Ayziah sets the example of Leadership, Sportsmanship, Dedication and Commitment. Her teams was also CSL Fall Season League Bracket Champions and she was the scoring leader with 49 goals and 13 assists over 41 games. Ayziah also excels off of the pitch at Lompoc Valley Middle School where she is Enrolled in all Honors classes and has a 4.14 GPA. The CVSC 2015 Male Player of the Year is Aaron Lee of CVSC Katana B00 a Silver Elite level team. Aaron is a Holding Midfielder and Team Captain for both his Club & High School teams. Off the pitch, Aaron truly epitomizes the best our community has to offer as a Honor Roll student at Righetti high school with all Honors & AP classes. Aaron volunteers at the Foodbank, Boys & Girls Club, Public Library & Marian Hospital. In the future he hopes to attend the West Point Military Academy. The honor of Coach of the Year went to Eddie Silva for his leadership and work with CVSC Ultimate G98. Eddie took over the team a few years ago and was a driving force in the team’s success highlighted by 7 tournament championships and being promoted from the Bronze level to the elite Gold level of play. Volunteers of the year went Budd Jamieson and Jamie Sonsini for their work as the Club Registrars for the CVSC Santa Barbara based teams. Coastal Valley Soccer Club (CVSC) was pink in October to support cancer research awareness. CVSC teams traded in their Maroon and White CVSC game jersey for a special pink jersey with the CVSC logo and a cancer awareness research logo. CVSC Cosmos B01 Boys under 13 soccer team was one of many teams from the Coastal Valley Soccer Club that donned their pink jerseys for October. But CVSC Cosmos B01 thought that being aware wasn't enough, this team chose to raise some money to support cancer patients in the Santa Maria valley. The team raised funds by getting pledges for goals scored during the month and getting donations from businesses and individuals, both in the Santa Maria area and beyond. Collectively, CVSC Cosmos B01 raised $2000. On November 6th, CVSC Cosmos B01 met with Dr. Dichmann, Medical Director of Marian Cancer Center. CVSC Cosmos B01 presented Dr. Dichmann with a check for Mission Hope and Dr. Dichmann led the team and their families through the facility, showing them some of the new technology while providing relevant and interesting facts about cancer, its treatments, and Mission Hope's efforts in the community. Dr. Dichmann did an excellent job answering the boys questions and giving them purpose for their fundraising efforts. Coastal Valley Soccer Club is very proud of the Players and Coaches for honoring CVSC core values of developing young players into great soccer players and people on and off the pitch. The Coastal Valley Soccer Club (CVSC) sent multiple teams to the San Luis Obispo Soccer Club Summer Classic tournament this past weekend. The tournament featured 187 teams from all over Southern and Northern California. Coastal Valley Soccer Club teams brought home three championships and three Finalists awards. CVSC Chelsea B03 were crowned BU11 Premier Champions of the SLO Summer Classic tournament. This marks the second tournament championship for this team this summer. 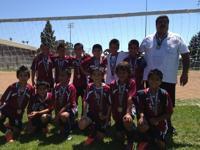 This team also played up a age group and won the Cool Summer Cup in Santa Maria earlier this summer. CVSC Cosmos B01 is a new team in CVSC and competing in only their second tournament ever brings home the BU13 Gold championship. In the championship game, CVSC Cosmos B01 defeated San Luis Obispo Soccer Club 6-1. In other tournament action CVSC had three teams bring home Finalist Awards. CVSC Katana B00 are Finalists in the BU14 Premier division. CVSC Elite G99 are Finalists in the GU15 Gold division. CVSC Ultimate G98 are finalists in the GU17 Premier division. The CVSC Teams will conclude the Summer tournament season over the next couple of weeks and prepare for the Coast Soccer League (CSL) Season starting in September. The Coastal Valley Soccer Club (CVSC) Girls Under 15 “CVSC Ultimate G98” were undefeated Champions of the Ventura County Fusion Spring Cup last weekend. CVSC Ultimate G98 posted a perfect undefeated 4-0 record during the tournament. CVSC Ultimate G98 scored 19 Goals in 4 games, and had no goals scored against them. Coastal Valley Soccer Club also had three other teams bring home medals from the tournament. CVSC Elite G99, CVSC Riptide G00 and CVSC Rebels G01 all earned finalists medals at the tournament. The Coastal Valley Soccer Club (CVSC) had a good showing in the 2014 Central Coast Spring League. CVSC Chelsea B03, CVSC Mustangs B01 and CVSC Rampage G01 were all crowned Champions of the 2014 Central Coast Spring League. CVSC Paso White B98, CVSC Ultimate G98 and CVSC Elite G99 also finished as Finalist. CVSC Katana B00 and CVSC Riptide G00 ended the season with 3rd place finishes. CVSC team will now begin their Summer tournament schedules. CVSC is expanding in the Santa Barbara and Goleta area. Currently we have the teams mentioned below with plans to add many more teams in multiple age groups on the Boys and Girls side. If you are an interested Coach or Player please contact SB Regional VP Hugh Hollis hughhollis@gmail.com or Mike Borges at borgesmichael@comcast.net. Coastal Valley Soccer Club (CVSC) held its third annual awards dinner last Saturday night at the Swiss Steakhouse in Santa Maria. Four awards were handed out to recognize the top male and female Players for the 2013 year, as well as the Coach and Volunteer of the year. Key attributes for the players which were nominated were on the field performance coupled with sportsmanship and academic excellence. The CVSC 2013 Female Player of the year is Leann Wolf of CVSC Chaos G95. Leann has played club soccer with CVSC for the last 7 years and has always contributed to her team’s success. The high school Junior also is in her third season as the starting goalkeeper for Righetti High school. As a result of her dedication and hard work she has multiple college coaches who have expressed an interest in her. The CVSC 2013 Male Player of the Year is Jon Sigurdson. Jon plays for the CVSC Renegades B96. Jon is a Team Capitan for the league champion CVSC Renegades and is known to cast a positive influence on his peers through his work ethic and positive attitude. Jon is a very accomplished student athlete enrolled in multiple AP classes and internships at UCSB. Jon also coaches and mentors an AYSO U12 boys team. The honor of Coach of the Year went to Paul Rodriguez for his leadership and work with CVSC Rebels G01. Paul was a driving force in the team’s success highlighted by an appearance in the CalSouth State Cup Finals. Volunteer of the year went Sydney Vincent for her work as the Club Registrar. Coastal Valley Soccer Club (CVSC) Rampage G01 girls under 12 team were crowned CalSouth State Cup Champions in San Bernardino last weekend. The Girls under 12 division was made up of a field of 76 teams from all over Southern California. In pool play in Santa Clarita on January 25th and 26th CVSC Rampage G01 was a perfect 3-0 scoring 12 goals in three games and only allowing one goal against. In the elimination rounds starting on February 1st and 2nd in San Diego CVSC Rampage G01 first faced Del Mar Carmel Valley Sharks and defeated them 4-0. In the round of 32 CVSC Rampage G01 defeated Slammers White from Orange County 7-1. In the round of 16 CVSC Rampage defeated Simi Valley Eclipse 3-1. Making this victory even more impressive is the fact that CVSC Rampage played most of this game a man down due to red card. In the Quarter Finals played February 15th in San Bernardino CVSC Rampage G01 defeated local team Madrid Premiere 3-2. CVSC Rampage would be tested in the Semi-finals when they faced Legends FC out of Chino one of the biggest soccer clubs in Southern California. CVSC Rampage G01 would find themselves down 2-0 in the semi-final match, but would finish regulation in a 2-2 tie. After two scoreless 10 minute overtime periods the teams went to penalty kicks with CVSC Rampage G01 prevailing victorious 5-3 on PK’s. In the championship game CVSC Rampage would again dominate with a 2-0 victory over PSC Laguna Beach Blue. Success is nothing new for CVSC Rampage G01 as of late, this team only has one loss in their last 33 matches going all the way back to last Summer. Coastal Valley Soccer Club (CVSC) Katana B00 traveled to Irvine last weekend and competed in the Orange County Kick Off Classic and were crowned Champions of the Silver Elite Flight. In pool play CVSC Katana B00 defeated Canyon FC of Anaheim 3-0. The CVSC Katana B00 then defeated CSA Extreme Black from Huntington Beach 4-1. CVSC Katana B00 then faced the LA Galaxy Academy team in the championship game and won 1-0. Coastal Valley Soccer Club (CVSC) hosted the 9th annual Cool Summer Cup 2013 in Santa Maria last weekend. This CalSouth sanctioned soccer tournament drew 70 teams from all over California including San Mateo, Bakersfield, Fresno, Palm Desert, Westlake, Burbank and the Central Coast. All of the local 24 CVSC teams also participated in the tournament. Tournament games were played at Pioneer Valley High School, Santa Maria High School, Atkinson park and Crossroads on Saturday and Sunday. This influx of soccer teams over the weekend had a positive boost to the local economy with many spending money at local hotels, restaurants and shopping. Coastal Valley Soccer Club (CVSC) had a very impressive victory in the Girls Under 11 Gold division where both CVSC G01 teams made it into the championship game after defeating all other teams in that division. CVSC Rebels G01 were crowned tournament champions, while CVSC Rampage G01 brought home the Finalists medals. In the Girls Under 10 division CVSC Outlaws G00 defeated the OUSL Crusaders 2-0 in the championship game to bring home the Cool Summer Cup Championship. In other tournament action, CVSC United B97 were crowned tournament champions in the Boys Under 15 division. CVSC Chelsea B03 were crowned finalist in the Boys Under 10 division while playing up one year in an older division. CVSC Pumas USA B98 were finalists in the Boys under 14 division. CVSC Elite G99 were also finalists in the Girls under 13 division. CVSC would like to send a special thank you to Alex Pasada and the entire staff at Santa Maria Parks and Recreation Department for all of their help and support in making this tournament a huge success every year. CVSC Katana B00 finished out their U12 season in a great fashion. Winning two tournaments in a row while on a hot streak of 13 straight wins in matches since February. CVSC Katana B00 most recent tournament Championship came as one of the host teams of the CVSC Cool Summer Cup 2013, hosted here in Santa Maria. CVSC Katana B00 were undefeated last weekend and crowned Champions of the tournament posting a perfect 4-0 record. CVSC Katana B00 tallied 22 goals while allowing only 4 goals against. CVSC Katana B00 most impressive victory came in the championship game with 5-0 win over San Luis Obispo Fire Soccer Club. Coastal Valley Soccer Club (CVSC) Katana Boys Under 13 were undefeated last weekend and crowned Champions of the San Luis Obispo Summer Classic soccer tournament top flight Gold division. In pool play CVSC Katana defeated Mustangs S.S. Lazio from Danville 2-1. CVSC Katana also defeated Bullard United SC from Fresno 3-0 in pool play. CVSC Katana B00 saved their best for the Championship match and won the final 2-0 against the Central Coast Condors. This marks the third tournament championship that CVSC Katana B00 has won this year. CVSC Katana B00 had previously been crowned champions of the Cool Summer Cup in Santa Maria and the Ventura County Fusion Spring Cup. The Coastal Valley Soccer Club (CVSC) Boys Under 9 “CVSC Chelsea B03” team were undefeated Champions of the Ventura County Fusion Summer Cup Soccer Tournament last weekend. CVSC Chelsea B03 posted a perfect undefeated 4-0 record during the tournament. CVSC Chelsea B03 scored 25 Goals in 4 games, and only allowed 10 goals scored against them. CVSC Chelsea B03 posted wins against Ventura County Fusion, San Luis Obispo Fire SC and Roadrunner United FC from Bakersfield. In other tournament action CVSC Rampage G01 were Finalists in the girls under 11 division. CVSC Rebels G01 is a first year club team formed from local All-Star teams. These Girls entered the State Cup competition with 66 total teams in their division, and made it all the way to the Championship game. The CVSC Rebels loss in the Championship game 1-0, but we are so proud of all that these Girls have accomplished. 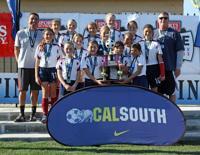 The CVSC Rebels Championship run consisted of 9 games played over 3 weekends in Lancaster and San Bernardino. CVSC Rebels G01 posted a record of 6 wins, 2 losses and 1 tie. CVSC Rebels G01 scored 21 goals in 9 games, and only allowed 4 goals against with 6 shutouts. During these 3 weekends these Players and their families drove over 1300 miles, and spent over 21 hours in transit. Pool play started at the Lancaster National Training Center with games against Canyon FC from Anaheim Hills, Santa Monica United FC, and Legends FC South Black from Chino. CVSC Rebels G01 finished second in their pool and advanced to the round of 32. In the round of 32 the Girls faced another team named Rebels from Bonita California and were victorious 3-0. In the round of sweet 16 the CVSC Rebels G01 faced Platinum FC from San Bernardino and defeated them 1-0. In the Quarterfinals CVSC Rebels G01 defeated the Saddleback Strikers 1-0. Then ON Saturday in the semifinals in San Bernardino CVSC Rebels G01 defeated Murrieta Surf White 3-0. Later that afternoon, CVSC Rebels G01 would lose a close Championship game 1-0. Coastal Valley Soccer Club (CVSC) Katana Boys Under 12 were undefeated last weekend and crowned Champions of the Ventura County Fusion Spring Cup soccer tournament. Going undefeated in four matches CVSC Katana B00 tallied 15 goals while allowing only one goal against. After finishing pool play undefeated, CVSC Katana entered the semifinals as the number one seed. In the Semifinals CVSC Katana B00 defeated Madrid Premiere of Paso Robles 1-0. CVSC Katana B00 saved their best for the Championship match and won the final 5-1 against Conejo Valley United (CVU). CVSC Katana Head Coach is Gonzo Garcia, and the Team Manager/Assistant Coach is Mike Borges. In other tournament action, CVSC Vipers G97 Girls Under 15 were also tournament champions in Ventura last weekend. CVSC Vipers G97 opened pool play with a loss to FC Hasental of Simi Valley. CVSC Vipers G97 bounced back with wins over Orcutt Crusaders and Oxnard United. In the Championship game CVSC Vipers G97 defeated Bakersfield Roadrunners 1-0. CVSC Rebels G01 recently finished competing in the 2012 Central Coast Soccer League (CCSL). Competing against teams from Bakersfield to Santa Barbara, CVSC Rebels finished in first place by posting a 9-1 record during league play and won the championship in the CCSL League Cup Tournament. During the season, the Rebels scored 46 goals and allowed only 5 goals. CVSC Ultimate G98 recently finished competing in the 2012 Fall Coast Soccer League (CSL). Playing teams from Bakersfield to Los Angeles, CVSC Ultimate G98 finished in first place by posting a perfect 10-0 record. During the season Ultimate scored 36 goals and allowed only 7 goals against. Their first place finish allows CVSC Ultimate to be promoted to the Silver division for the 2013 Fall Season. The Coastal Valley Soccer Club (CVSC) Blaze G97 team went undefeated last weekend at the 14th Annual Thousand Oaks Classic and won the Girls under 15 division. CVSC Blaze started pool play on Saturday morning with a 4-0 win over Madrid Premiere from Paso Robles. Then on Saturday afternoon CVSC Blaze defeated Santa Clarita Valley Magic 2-1. The last pool play game on Sunday morning was a 4-2 win over Oxnard United Soccer Club. By going undefeated and winning their pool, CVSC Blaze qualified for the Championship game as the number one seed. In the Championship game CVSC Blaze faced tournament host Newberry Park Pumas Soccer Club on their home field. CVSC Blaze showed Champions poise by winning a back and forth final 4-2, and securing the 2012 Thousand Oaks Classic Championship. In other tournament action the CVSC Madrid B96 were Champions of the Boys under 16 Division posting a record of 3-0-1 in the tournament, and defeating Conejo Valley United 1-0. CVSC Katana B00 were Finalist of the Boys under 12 division. The Coastal Valley Soccer Club (CVSC) Boys Under 10 “CVSC United B02” were crowned Champions of the North vs. South Tournament in San Luis Obispo last weekend. This tournament boasts a reputation for matching up some of the best Teams from Southern California with some of the best Teams from Northern California. CVSC United B02 posted a record of 3-0-1 in the tournament, and in the championship game defeated Central California Soccer Alliance B02 team 4-1. CVSC Pumas B97 also won the Championship of the Boys under 15 division. CVSC Pumas posted 3 wins and one tie over the weekend. In other tournament action CVSC had numerous Finalist finishers including CVSC Rampage G01, CVSC Rebels G01, CVSC Ultimate G98 and CVSC Blaze G97. The Coastal Valley Soccer Club (CVSC) Katana Boys Under 11 Team closed out their U11 campaign with a great showing at the CVSC hosted Cool Summer Cup. Going undefeated in four matches they tallied 20 goals while allowing only 4 goals against. In pool play CVSC Katana defeated Ventura County Fusion 5-2 and Madrid Premiere 9-1. In the Semifinals CVSC Katana defeated Legacy FC of Templeton 3-1. CVSC Katana saved their best for the Championship match and won the final 3-0 against the only other undefeated team from bracket play, the Central California Blues from Bakersfield. "In the final we showed what we are all about" Coach Gonzo Garcia stated, he added "we were highly organized on defense and the boys executed perfectly on offense, they have worked really hard this past year and it is nice to see it pay off so well." The Coastal Valley Soccer Club (CVSC) Girls Under 13 “CVSC Ultimate G98” are undefeated Champions of the Central Coast Soccer League (CCSL) Spring Season. CVSC Ultimate G98 posted a perfect undefeated 7-0 record during the Spring League. During the Spring Season CVSC Ultimate faced club level competition from Lompoc to Bakersfield. CVSC Ultimate G98 scored 29 Goals in 7 games, and only allowed 8 goals scored against them. The Coastal Valley Soccer Club (CVSC) boys Under 9 “CVSC United B02” are Champions of the Central Coast Soccer League (CCSL) 2012 Spring League. CVSC United B02 posted a perfect undefeated 6-0 record during the Spring League. During the Spring Season CVSC United faced club level competition from Santa Barbara Soccer Club (SBSC) Teams and Teams from the Central Coast Condors club. CVSC United B02 scored 49 Goals in 6 games, and only allowed 13 goals scored against them. This is truly an amazing accomplishment considering this is a brand new Team that was formed about three months ago during the CVSC Club Tryouts back in February. Coached by long time Santa Maria Valley Coach, Francisco Zepeda, the future looks very bright for this young and very talented team. CVSC will buy back old CVSC uniforms that are in good condition to be provided to scholarship players. Buy back uniforms must be complete sets including shorts, home and visitor jerseys. Contact any Board Member for more info. The Coastal Valley Soccer Club (CVSC) Blaze G97 team has started the new 2011 Season by winning two consecutive tournament Championships. In March, CVSC Blaze won the Santa Barbara Soccer Club Spring Cup. CVSC Blaze followed that tournament Championship, with another tournament Championship this last weekend at the Madrid Premier Cup played at the Damon Garcia Sports Complex in San Luis Obispo. CVSC Blaze started pool play on Friday night with a 2-0 win over the Central Coast Condors. Then on Saturday afternoon CVSC Blaze defeated the Orcutt United Soccer League Crusaders 2-0. The last pool play game on Sunday morning ended in a 1-1 tie against Madrid Black of Atascadero. This performance in pool play qualified CVSC Blaze for the Championship game as the number one seed. In the Championship game CVSC Blaze again faced Madrid Black. This was a very physical and tough Championship game that ended regulation play in a 0-0 draw. The two Teams then entered into two five minute overtime periods. CVSC Blaze showed Champions poise by scoring the winning goal in the first overtime period, and securing the Madrid Premier Cup Tournament Championship. The Coastal Valley Soccer Club (CVSC) Blaze G97 team has just started the new 2011 Season making it to the Finals of the Ventura County Fusion Spring Classic Tournament. CVSC Blaze started pool play on Saturday morning with a 2-2 tie to AC Milan Red of Santa Clarita. In the second game of pool play CVSC Blaze tied Eagles Soccer Club of Camarillo 1-1. This performance in pool play qualified CVSC Blaze for the Semifinals as the number two seed. In the Semifinals CVSC Blaze faced Eclipse SC from Simi Valley, who had not had a single goal scored against them in pool play. This Semifinal match ended regulation play with a 1-1 tie. The Teams then entered into two seven minute overtime periods, and neither Team was able to score in overtime. The Teams then entered into FIFA penalty kicks. In PK’s the CVSC Blaze Goal Keeper Allie Betts showed her skills making two diving saves on would be goals from Eclipse SC penalty kicks. The CVSC Blaze Strikers also showed their skills with Karla Ramirez, Jaylyn Schaefer and Halen Borges scoring penalty kicks. CVSC Blaze won the Semifinal match 4-2. In the Championship game CVSC Blaze faced Apex SC of Thousand Oaks. Again CVSC Blaze would finish regulation play with a 1-1 Tie. The CVSC Blaze again entered into two overtime periods, but this time came up short allowing Apex SC to score the winning goals in overtime of the Championship game. CVSC Blaze ended the tournament being awarded Finalist medals. 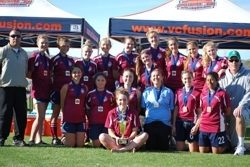 A few months short of completing their first year as a team, the CVSC Ultimate G93 girls won their first tournament championship this past weekend at the 2010 Ventura Fusion Spring Classic in Ventura. The Ultimate girls went undefeated and gave up NO goals over the weekend. Their strong defensive effort was matched by balanced scoring as four different players scored over the weekend. Congratulations ladies on a well deserved championship. The CVSC Ultimate GU16 team travelled to Santa Barbara this past weekend to compete in the 2010 Santa Barbara Spring Cup. Following their Championship in Ventura the previous weekend, the Ultimate girls were eager to prove that the results in Ventura were no fluke. Backed once again by great defensive play, the girls went undefeated in pool play, beating higher ranked North Valley Fusion 2-0 and drawing 1-1 versus another higher ranked Westside Breakers team. The girls were on their game again on Sunday morning, beating Santa Monica United 2-0 and earning a spot in the Championship versus the host Santa Barbara Soccer Club. The Championship was a fast paced, well played game for both teams but ended 0-0. Penalty kicks would decide this one and while goalie Mikayla Allan did her job, blocking the first two SBSC kicks, the girls couldn't muster enough and lost 2-3. This was the second straight championship for Ultimate in the past two weeks and they have given up only one goal over the past 7 games. Nicely done ladies! Fresh off their 2010 Tournament of Champions Championship in December in Irvine, CVSC Chaos G96 travelled to Ontario this past weekend to play in the Celtic Cup. Just as they had done in Irvine, the Chaos girls completed pool play with 3 shutouts and finished the weekend off with a PK victory in the Championship game. Congratulations to the Chaos girls and families and good luck in State Cup. The 2010 CVSC United G93 team competed this past weekend in the Eagles Spring Classic in Camarillo, playing in a tough bracket with Silver Elite and Gold ranked teams. United was able to secure a place in the Championship game with a 1-0 victory over Westside Breakers FC White, only to lose to this same team 1-2 in the Championship. United continues to attend highly competitive tournaments and will travel to San Diego at the end of March for the Nomads College Showcase. Good job United! The Coastal Valley Soccer Club had a successful weekend of tournament play in the Bakersfield Brigade Invitational this weekend as both the Manchester United BU14 and Chelsea BU13 teams won Championships. Neither team suffered a defeat during the entire weekend. During the month of January, CVSC has been crowned Champions 3 times, with Manchester United, Chelsea and Chaos GU13 all receiving championship trophies. Congratulations are in order for all CVSC teams who participated in Coast Soccer League and Central Coast Soccer League this past fall. In CSL action, 3 of our 7 teams performed well enough to promote to higher levels with 2 division championships also being achieved. In CCSL action, 2 of the 3 CVSC teams won division championships. First Place Silver North GU16 CVSC United G93 Promotes to Silver Elite for 2010. First Place Bronze Alpha GU13 CVSC Chaos G96 Promotes to Silver for 2010. Second Place Bronze North GU17 CVSC Impact G92 Promotes to Silver for 2010. Third Place Bronze North GU16 CVSC Ultimate G93. Fifth Place Bronze Alpha BU14 CVSC Barcelona B95. ©2019 Coastal Valley Soccer Club / SportsEngine. All Rights Reserved.